From Yodis et al, 2003. 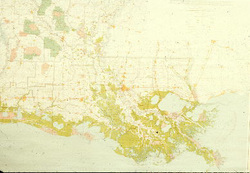 The official map of Louisiana that was sold by the state throughout the 1970s-1990s. It was never adjusted for coastal wetland loss. 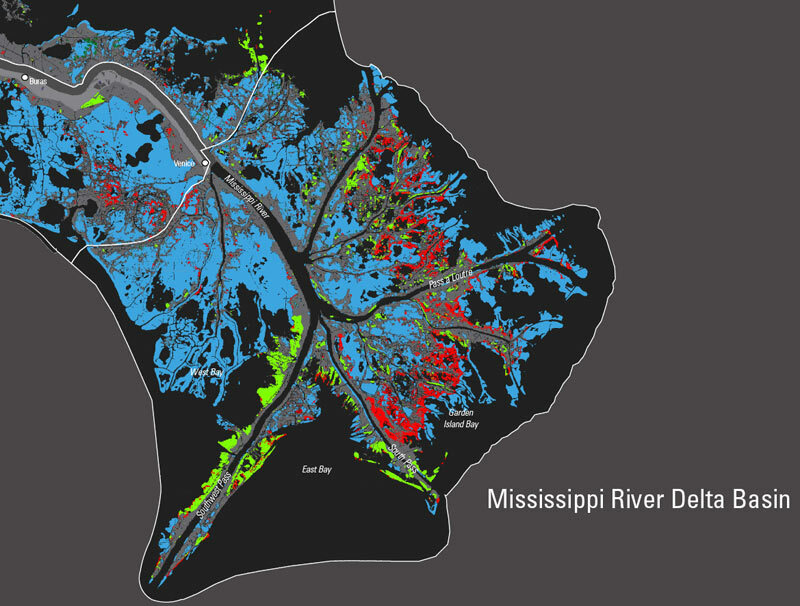 Compare this to the new map (below) adopted in 2000. 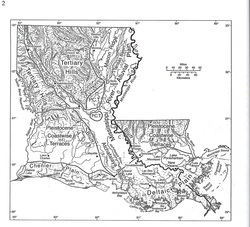 The official Louisiana map dated 2000. 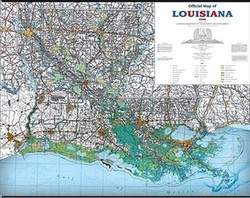 Note how different the coast looks compared the the long standing official map (above) that was still sold by the State throughout the 1990s. 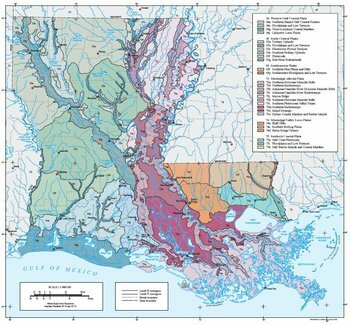 This map shows the drainage basins in Louisiana. 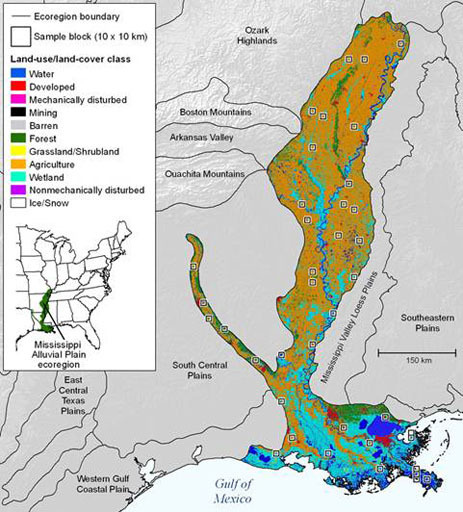 In New Orleans, we are most aware of the Pontchartrain Drainage Basin due to the excellent work of the Lake Pontchartrain Basin Foundation. From Yodis et al., 2003. 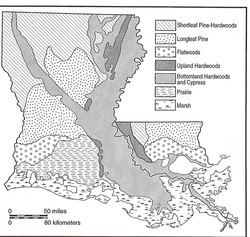 Louisiana has a simplistic physiographic history as compared to, say, Colorado or Texas. 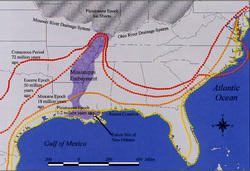 This map is simplified below. From Yodis et al., 2003. 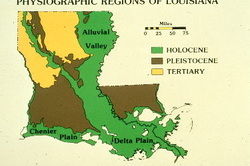 The more complicated physiographic map of Louisiana above is summarized here to show the older (Tertiary) land, then that from the Ice Age (Pleistocene), and the recent (Holocene). For the naturalist, these descriptive zones, defined by their dominant vegetation types, help define the differences in biodiversity and species composition in different areas. 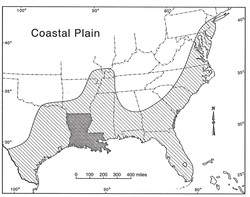 From Yodis et al., 2003. 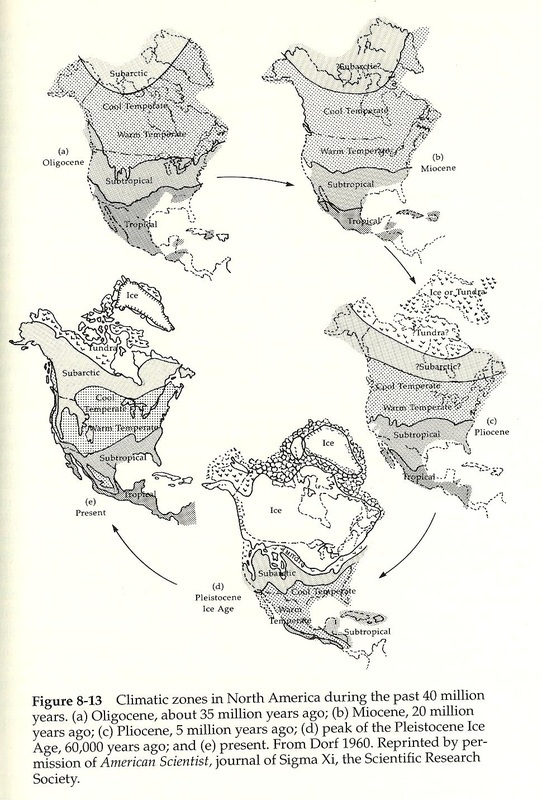 These descriptions work, but naturalists most often use the terms used in the map above. These terms are frequently used by naturalists and other for general regions fo the state. 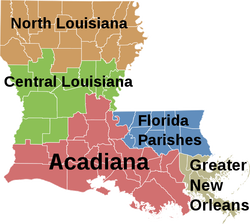 "Florida Parishes" is used because that region used to be part of Florida. 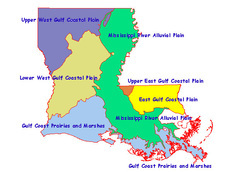 It is very interesting biologically because it is part of a continuum that extends to the Atlantic coast, and there are many species of plants and animals whose entire range in Louisiana is in this area. 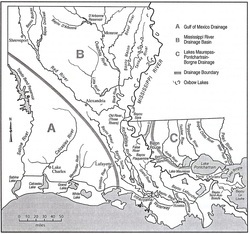 This map has the waterways superimposed on a Louisiana Department of Wildlife & Fisheries 1978 coastal map that illustrates to location of the four types of coastal marshes: saline, brackish, intermediate, and freshwater. 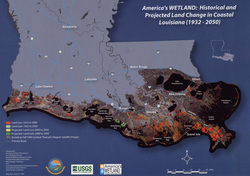 This map is by the America's WETLAND Campaign. It shows what vegetated wetland was lost or is projected to be lost during what year spans over an approximate 120 year period. For a summary of changes between 1956-2006, click here. The Mississippi River in flood stage in May, 2011. 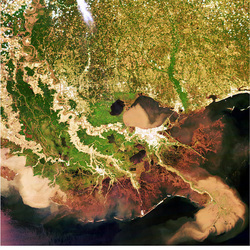 Note the plume of typically tan (due to clays) river water entering the Gulf of Mexico at the mouth of the river and at the Atchafalaya River to the west. Also, note the similar plume entering Lake Pontchartrain through the totally open Bonnet Carre Spillway.